1Place the steaks in a shallow dish or zip-top bag. Mix olive oil, garlic and 2 tablespoons of steak seasoning together, and pour over the steaks, turning the meat over and rubbing the marinade in to coat both sides. Marinate for 1-2 hours, turning steak once halfway through to coat again with the sauce. 2When ready to cook, prepare a charcoal grill for direct high heat (450-500 degrees F) using Kingsford® Hickory charcoal. Brush the cooking grates clean. 3Remove the steak from the marinade. Place steak on the grill and cook with the lid closed, turning once or twice, until cooked to your desired doneness, 6-8 minutes for medium rare. 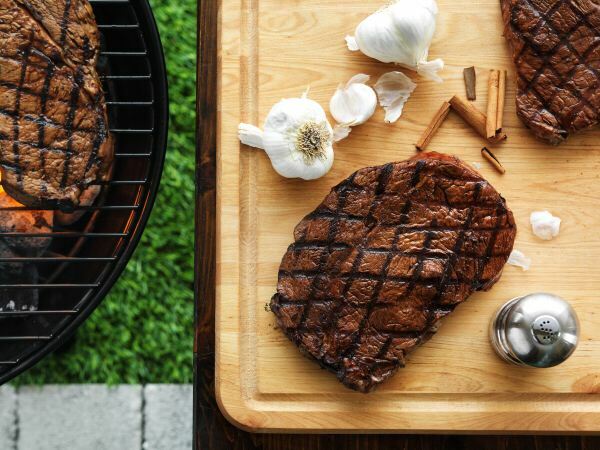 Remove steaks from the grill and let rest for at least 5 minutes before serving. Serve with A.1. steak sauce, if desired.